1. for those irregular shape of the sculpture, the surface seems to have been fixed very tight, when subjected to under the pressure will shake before and after. At this point, you can try to pad some of the waste material under the object to increase friction. Also is retained items comes with the package, while the objects are irregular in shape, but to their own packaging may is very regular and easy to be fixed, plus a small band, irregularly shaped objects can easily be fixed. Or try to fix the parts of the rules with the tools, and discard the irregular parts. 2. check the engraving used pliers or a clamping head is wrong. At the same time, woodworking CNC Router ( http://www.roc-tech.com/product/product35.html ) pliers or a clamping head wear will lead to the misalignment are carvings. The pliers head or card if too tight, the knife head contacts are carvings moment will lead to be carving popup. 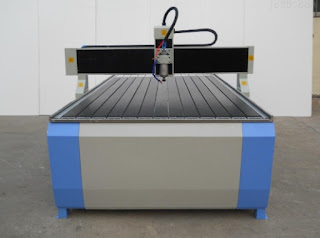 3. carved suffered under pressure if large, considering about whether you should use conical cutter nose, if CNC Router diamond cutter head in the process of carving mobile when pressure is too large, tool side, the pressure will be caused by carved objects move. If an incorrect diamond knife is used, it will lead to the same problem. A diamond knife with a 90 or 100 degree will be deep into the material, and the material will be moved in the process of engraving. 4. for carving plastic pattern can be reposted tape on the back are carvings, then taped to the side spray liquid glue, then affixed to a void on the surface, which can avoid the use of double-sided adhesive, and left to clean the surface. Because the tape stripping and cleaning easier. Using a special carved tape, the tape side than on the other side of the viscous strong, so the plate can move freely or replaced. 5. due to woodworking CNC Router are often equipped with multifunctional pliers or a clamping head. And they are made of iron, so easy of carved caused by injury or the slide in the carving process, then choose some rubber cap or rubber tube for carved objects fixed will help.